The Witney Taxi section of the Witney website is where you can find information on taxi companies in the Witney area. If you are looking for a taxi in Witney you will find details of local taxi companies on this page. An entry on this Witney Taxi page (see below) costs from £89 + VAT per annum, that's about 24p + VAT per day! Or you can choose a sponsored listing (see right) for just £145 + VAT per annum. The main Witney taxi rank can be found on Witney High Street, outside The Cross Keys pub and Waterstones book shop. There are usually a plentiful supply of taxis waiting to take you to your chosen destination. 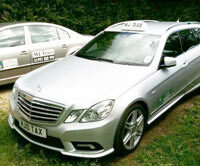 MJ Taxis provide a local taxi service in Witney and the surrounding Oxfordshire area. We also offer a national service for airport trips, station trips and other longer distance trips. We are renowned for our punctuality, courteousness and sheer professionalism transporting you, your family or colleagues to your destination. Whether you are going to the theatre, airport or seaport or perhaps having a tour of the many interesting areas that surround Oxfordshire. MJ Taxi's will be there for you.